The year 2020 will mark the one hundredth anniversary of the ratification of the 19th Amendment to the U.S. Constitution — guaranteeing the right of women to vote. The Women’s Suffrage Celebration Coalition of Massachusetts is partnering with the Commonwealth Museum to present “Suffragist of the Month” display panels from August 2017 through August 2020, the centennial of the ratification of the 19th Amendment. By the completion of the project, all of the names listed on the last panel, “Prominent Suffragists,” will have a panel. 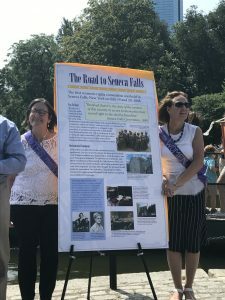 The first panels were unveiled at the Women’s Equality Day event, August 24, 2017. The panels are on display in the Commonwealth Museum lobby, are featured below, and are on the Commonwealth Museum’s website.